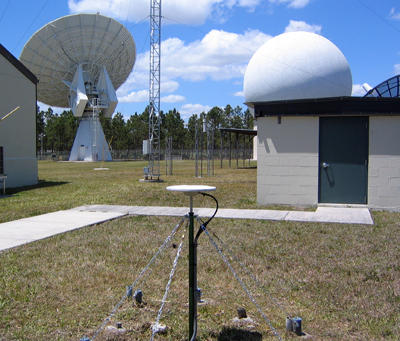 The new NASA-JPL high-rate real-time station RCM7 was installed at the CSTARS (Center for Southeastern Tropical Advanced Remote Sensing) facility, which is part of the Rosenstiel School of Marine and Atmospheric Science, located on the University of Miami Richmond campus in Southern Miami-Dade, Florida. The campus is being used as a high capability receiving and analysis facility for X-band satellite data. The facility supports a diverse range of Earth science applications in land, atmosphere, ice and ocean sciences, as well as more applied uses in the fields of environmental monitoring, and natural hazard assessment. There is also a fixed Mark III VLBI (Very Long Baseline Interferometry) antenna in use. RCM7 consists of a Tech2000 mast setup over an existing mark called TIMER. TIMER is part of the National Spatial Reference System (NSRS) and was installed in 1962. The mast is held in place using six chains, each attached to a 2.5 inch diameter pipe which surrounds the mast. The GPS system consists of a Trimble Zephyr Geodetic Antenna and a Trimble NetRS GPS receiver, which provide 1 Hz data for JPL's real-time network. Because of the sites southern location, and the corresponding amount of lightning that occurs there, fiber optic cable had to be used to route the internet connection from one building into the building where the GPS equipment is housed. Reconnaissance was also performed in order to identify a possible location for installation of a permanent monument.